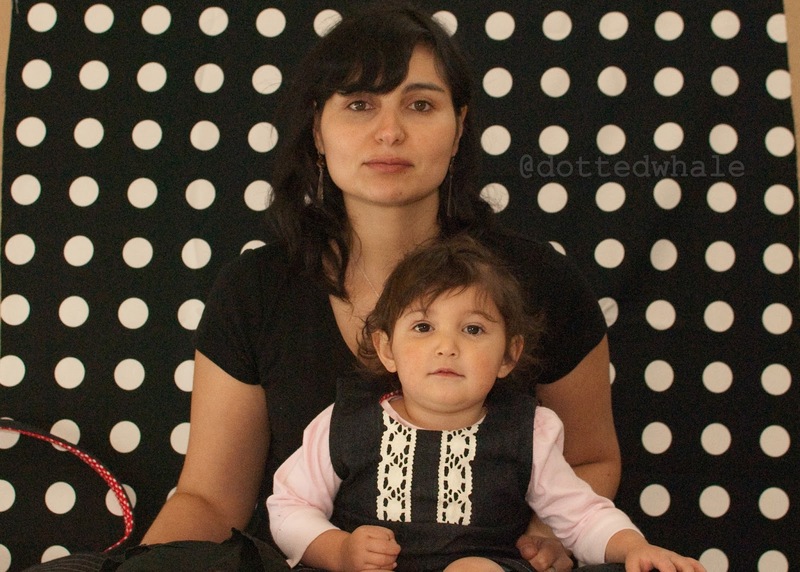 Today I welcome lovely Carolina from Dotted Whale on my blog. Carolina and I first 'met' about a year ago. We both participated in a secret handmade swap hosted by another You & Me participant, Rachael. After Carolina shared more about herself we realised that we had a lot in common. We both grew up in countries that were undergoing significant changes. English is our second language. We both live miles away from our families of origin. We are both addicted to sewing. Carolina's sewing is gorgeous! Just look at these Scrubby Jam tops she made for her sons! What about these cool shorts? I also love this hoodie. 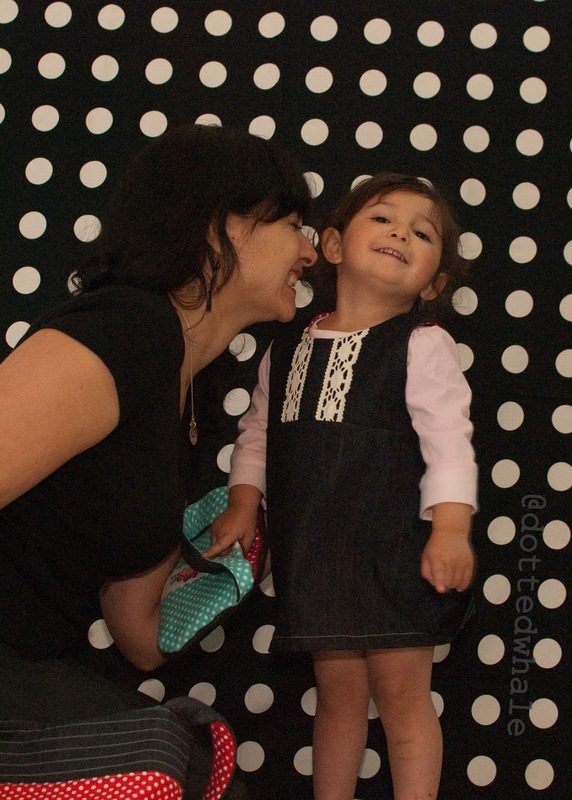 Carolina's little girl looks so cute in her Norah dresses in this post! And this little dress is my absolute favourite! Hello, I'm so glad to be here today at While she was Sleeping and for the invitation to be a part of "You & Me" Series. I'm a mother of three kids. Two boys and one little girl. Little Girl, Oh! I have no words to explain it. 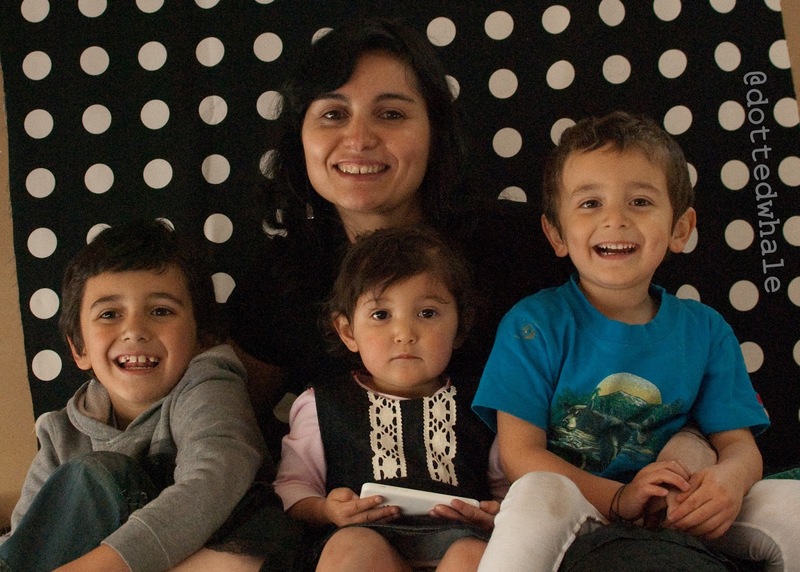 We moved from Chile to Canada almost three years ago. Little boy was a baby, he was 11 months old, he didn't walk. Four months later I discovered I was pregnant. My first thought was "my gynecologist isn't here". We didn't think about more kids. I freaked out, really and I didn't understand how the things worked here. Long story short, Little Girl was born and she is now our Little Princess. Oh My! She is so girly, in her way. No pink, no ruffles, yet! But she loves stuffed animals and dolls. Different but similar to her brothers. To me it was perfect. I used to dream about sewing dresses and now I can sew them!!! We, parents of more than one child, usually say we don't have a favourite child and I don't, but Little Girl melts my heart every day. For "You & Me" I chose to make something girly and what is more girly than a purse or a handbag, eh? Actually two, one for me and one for Little Girl. 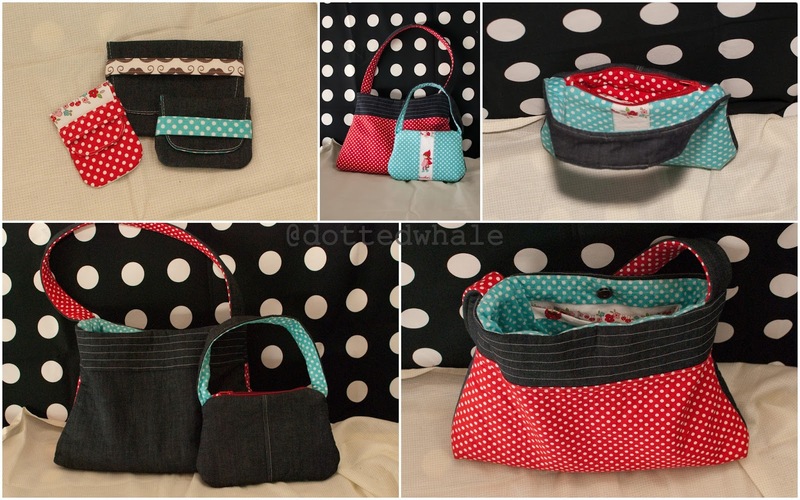 I had these fabrics in my stash in two colours and I combined them with denim. 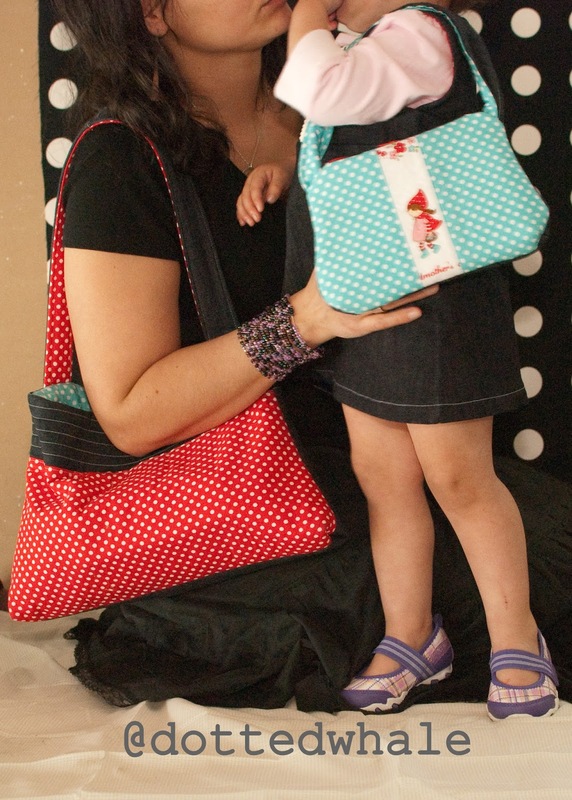 The dotted fabric is about Little Red Riding Hood, perfect for Little Girl. Patterns: Simplicity 2617, Michelle Patterns. I also made three card wallets. For me, for Little Girl and for my mom, her birthday is tomorrow. The big card wallet is for her and it's flying to Chile. Inspired by the host and in honor of her. I sewed a Debbie's Birthday Dress for Little Girl. The chosen fabric is denim and the lining is the dotted fabric in red but you can't see it in these pictures. Coincidentally, Jenya posted a new Debbie's Dress for Little Monkey last weekend while I was sewing this one, her version. She loves her bag and mommy's phone. 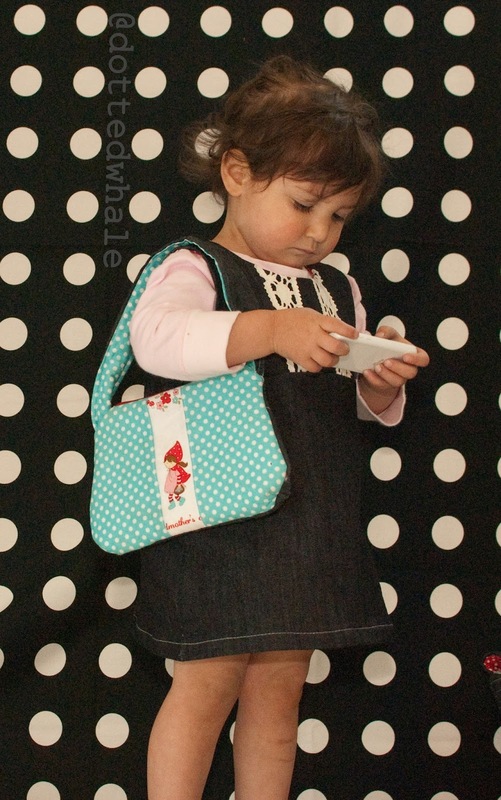 She plays and imitates everything I do, so the purse is a very good choice. Now, she can't put a foot outside the house without it. So cute! I have to mention. I took the pictures in my garage and it was really exhausting. My three years old son helped me a lot. He took the first pictures, then I found the remote control. It is raining here, so no pictures were taken outside. More pictures?............. Little Girl and Me. Enjoying the photo session. 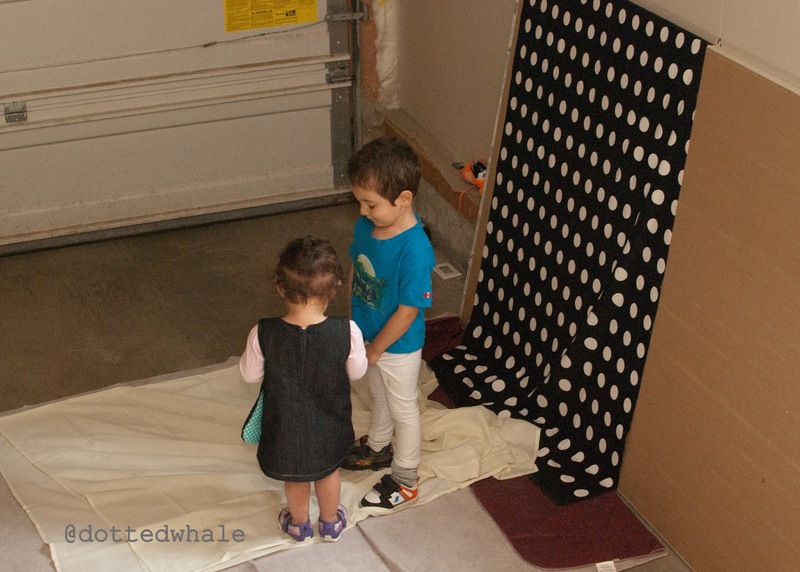 The photoshoot was so long that when Big Boy arrived home from school, we were still taking pictures. Good, because now I have a picture with my kids. Thank you Jenya for creating this lovely series and for having me today. Thank you Carolia. It was a pleasure to read about your creations and how you managed to turn a photo-shoot on a rainy day into a fun family activity! 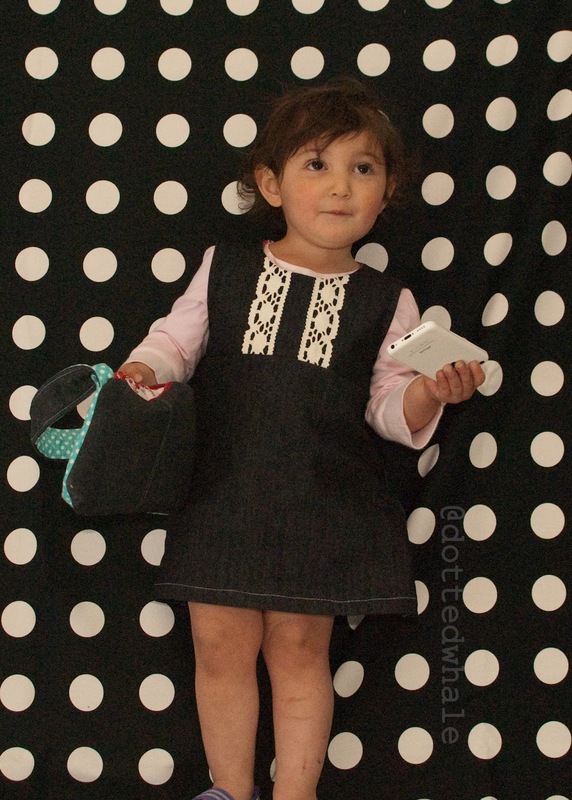 The bags, the purses and you Little Girl's dress are gorgeous. I am sure your mum will love her purse. That's true. Little Girl has a Lightning McQueen in her bag minutes before the photoshoot. Thank you for having me Jenya. This is a beautiful series.